The Bisbee Turquoise Necklace on the left is a spectacular Navajo Cluster style Necklace, this style of multi stone cluster work has been done since the early 1900's. 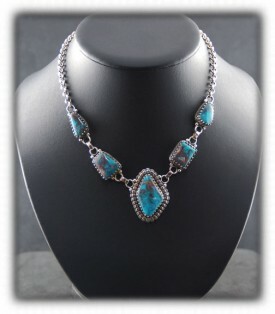 The fabulous Bisbee Turquoise gemstones in this necklace are very rarely seen these days as no Bisbee Turquoise has come out of the mine since 1978-9. This Bisbee Necklace was made by Vernon Begay for Durango Silver Company, it is a one of a kind and it will never be reproduced. Click on the photo to learn more. The Bisbee Turquoise Necklace on the right is another unique Southwestern piece of Bisbee Turquoise Jewelry, this one was made by John Hartman of Durango Silver Company. 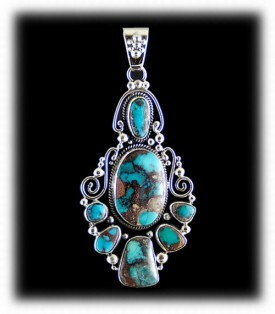 John cut this piece of rare Bisbee Boulder Turquoise and created this wonderful piece of art from it. It was made in John's new Victorian style of Silverwork that you will only see from John. 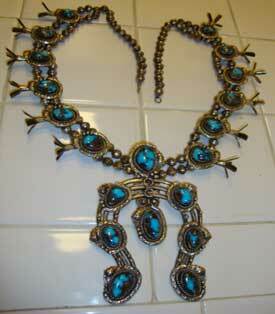 This is a wonderful Turquoise Necklace handmade in America by John Hartman. Click on the photo. The upper Necklace to the left was hand crafted by John Hartman of Durango Silver Company, it features three beautiful and very large Bisbee Turquoise Gemstones, all from the same rock. This Necklace was made to display at the Tucson Gem Show in 2010, it attracted the eyes of notable gemologists from many areas in the world. Turquoise has now become one of the top ten selling gemstones on earth and Bisbee Turquoise is known as the #1, highest grade of Turquoise that has ever come out of this earth. This Bisbee Turquoise Necklace is a wonderful example of what fine Turquoise is and the Silverwork by John Hartman accents these fine gemstones perfectly. The upper right Bisbee Turquoise Necklace is another exceptional Turquoise Necklace created by John Hartman, a master Silver and Goldsmith from the American Southwest. John's work is renown world wide by fine Jewelry collectors as being some of the finest Gold and Silver Jewelry coming out of the Southwestern United States today. 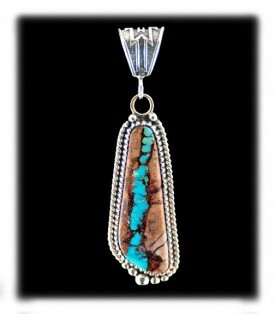 John's Silver and Gold work along with his rare Bisbee Turquoise is out of this world! 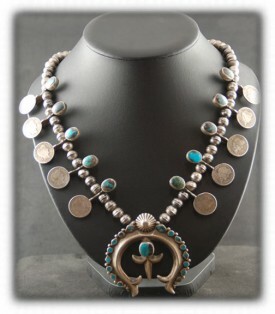 Above and to the left is a Vintage Navajo Dime Necklace with Bisbee Turquoise gemstones. Necklace like this were made in the 1020's, the Bisbee Turquoise in this necklace must have come out of the mine early or the Necklace was a later made Necklace to look like an older piece as the Bisbee Turquoise heyday started in the 1940's. Click on the photo. To the right is a beautiful Native American Bisbee Turquoise Squash Blossom Necklace, it features old Arizona Turquoise, we presume it is Bisbee. This is an older Navajo Squash Blossom Necklace that was made in the 1970's which was in the time period when Bisbee Turquoise was in the marketplace. Above and to the left is a set of Santo Domingo Bisbee Turquoise Jatals, a Bisbee Turquoise Necklace bottom dangles. It is very rare to find Bisbee Turquoise that was hand cut into Turquoise Beads, making Turquoise Beads from any type of Turquoise is expensive as there is a lot of waste when making beads. 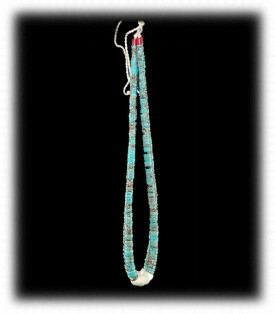 Click on the photo to read more about this set of Santo Domingo Bisbee Turquoise Beads. Above and to the right is a Victorian style Bisbee Turquoise Necklace handmade by John Hartman of Durango Silver Company. 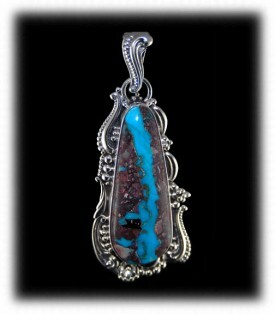 John cut this amazing Bisbee Turquoise gemstone and then he set it in this beautiful Silver setting. 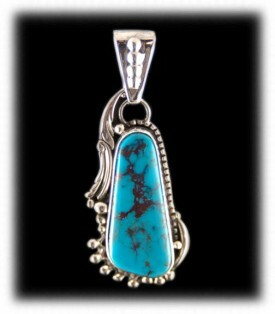 The Silver work in this case was made as an accent to enhance this beautiful Bisbee Turquoise Gemstone. The Bisbee Turquoise Necklace above and to the left is quite unique, this is Bisbee Ribbon Turquoise which is a directional cut of Turquoise vein that runs through a host rock. So, this is a narrow vein of Bisbee Turquoise that was formed in a crack of rock and several million years later it has become very hard which allows a stone cutter to cross cut the rock to obtain this unique gemstone cabochon. Above and to the right is a Bisbee Turquoise Necklace in Gold. This beautiful Turquoise Necklace was handmade by John Hartman and is intended for that person who prefers Gold over Silver. 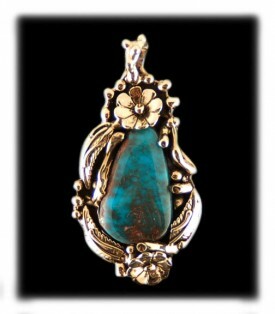 John creates a lot of Gold Jewelry and Bisbee Turquoise is his gemstone of choice. Bisbee Turquoise is absolutely fabulous in Gold as it sets the exceptional blue color of this Turquoise, we invite you to look at the many pieces of Gold Bisbee Jewelry that we currently have in stock by typing in Gold Jewelry in the search box to the upper left. About once every other month we send out a E-Mail Newsletter to inform our members of what's happening at Durango Silver Company, new products, specials for our members only and more. 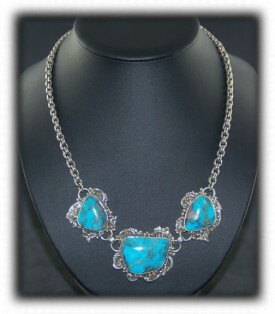 We also have a monthly drawing from our member base to give away Free Turquoise Jewelry. Please take a moment to become one of our friends by signing in below. We hope you have enjoyed our presentation on Bisbee Turquoise Necklaces and you will think of Durango Silver Company when considering your next Turquoise Jewelry purchase.